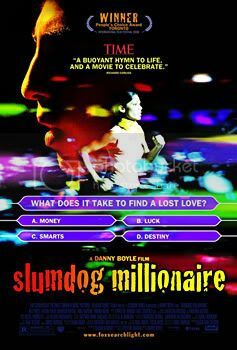 Slumdog Millionaire is the story of Jamal Malik, a contestant on the TV show “Who Wants to be a Millionaire?”. An uneducated young man from the slums who works in a call centre as a sort of odd-job boy, Jamal makes it all the way to the end of the competition and stands on the brink of winning the ultimate jackpot. He is detained by the police on suspicion of fraud – after all, who would believe that a boy from the slums would know all the answers? It is through the police interrogation that we learn of his background as an orphan growing up in the slums with his brother, Salim, and a fellow orphan, a girl called Latika. His life story is told through flashbacks – his mother being killed in a religious riot; life as a child beggar for gangsters and a narrow escape from being blinded; eking out a living stowing away on trains, selling goods, and posing as a tour guide at the Taj Mahal; rescuing Latika from the gangsters and then being separated from her by Salim; working in the call centre and finding Salim again after many years then also finding Latika – in the clutches of Javed, another gangster, for whom Salim is now working – but failing to rescue her. He went on the TV show in hopes of somehow getting through to her because he knows that she watches it. Movies being what they are, of course the police inspector decides that Jamal is no liar and permits him to return to the show for the final round. Salim, repenting of his past wrongdoings, helps Latika escape and gives her his phone and car keys. Jamal uses the Phone-a-friend lifeline for the final question and calls his brother, as that’s the only number he knows. Latika answers the phone and although she doesn’t know the answer to the question either, Jamal is relieved to find that she is safe. He randomly picks an answer and lo and behold, he wins. At the end, he is reunited with Latika at the train station – and I daresay that is all the reward Jamal needed. The story isn’t anything unexpected or earth-shattering but it is quite watchable. I thought the script well-written when pertaining to capturing and establishing the personalities of Jamal and Salim very early on and tracking them as they grew up – Salim, the bossy, brash and selfish boy, but very fond of his younger brother, and Jamal, the enthusiastic, kind and loyal one. Latika’s personality was a bit flat, and the viewer never really does get to know what she is like apart from being beautiful, pleasant and very fond of Jamal. But as it is Jamal who is the central character and not Latika, perhaps her relative two-dimensionality does not matter so much. The cast as a whole did very well. Dev Patel is magnetic as Jamal, and it really is Patel and the two boys who play the younger versions of Jamal, Ayush Mahesh Khedekar and Tanay Chheda, who carry the story. There is a rather splendid scene in which Jamal is supplied with an answer for a question in “Who Wants to be a Millionaire?” and he battles indecision over whether or not he should cheat to advance in the game. I thought Patel did excellently there. British director Danny Boyle as well as his cinematographer and production designer went all out to film the slums of Mumbai, in which a large part of the story takes place, and it successfully conveys the impression of the place, from the messy, narrow walkways, cramped spaces and the masses of people who live there. It is probably not the best representation of that side of India, and likely as not has some typical Hollywood-esque exaggeration to it, but I think it does a pretty decent job of capturing the feel of the place. There seemed to be frequent usage of canted angles and handheld shots especially in the first half of the film and while I am not really fond of such a style – to some extent, I much prefer Ozu Yasujiro’s method of still, calm shots to frenetic camera moves – admittedly, they work for the scenes they are used in. The scenes of the current narrative – the “now” in which Jamal is telling his tale to the police inspector – are mostly quieter and more regular shots, and this helps to give some balance to the visuals and the pace of the story. In a way, Jamal’s backstory is the driving force for almost three-quarters of the movie. “Who Wants to be a Millionaire” and the police interrogation are more like the frame for the picture of his story. Only towards the end of the film do the picture and the frame begin to merge. It is tempting to think of Slumdog Millionaire as a Bollywood film, with its Indian cast and setting, even though the dialogue is nearly all in English, but the Western production aesthetic becomes noticeable when one thinks about it. (As my memories of the Bollywood movies I saw on TV as a child are rather vague, I shall have to base my comparisons on more recent viewings of such films – namely Devdas (2002), 3 Idiots (2009), and My Name is Khan (2010).) In general, Bollywood films tend to be (a) rather too long, (b) exploding with colour, (c) melodramatic and a little bit escapist, and also tend to (d) include at least one musical segment. I daresay some of the more “modern” Bollywood films do away with the song-and-dance bit and stick to just having segments of the story driven by a song – like Khan did – but nevertheless, that is still regarded as one of Bollywood’s trademarks. Slumdog, at just about 2 hours is short in comparison to the others (Khan and 3 Idiots take about 160minutes each, and Devdas runs for 3 hours) and while Slumdog is far from being full of dull colours, it is nowhere near the bright vibrancy of 3 Idiots or Devdas. Naturally, this is highly dependent on content and Idiots was a dramatic comedy, whereas Devdas was all opulent fantasy – both of which almost demand a rainbow of colour. Khan, by necessity of the narrative and tone, could not be filled with crazy colours and thus is perhaps the closest to Slumdog both in terms of the visuals and the content. It did strike me that Slumdog felt and looked grittier and more serious and more in line with the Hollywood aesthetic. Khan was similar that way, but it wasn’t “gritty” in the way that Slumdog was for the most part. As for song-and-dance… Well, songs feature quite prominently in certain parts of the film, though only as background music. But at the very end, Slumdog gives us A.R. Rahman’s Jai Ho in typical Bollywood fashion with loads of people dancing (just short of more elaborate choreography, a wide open field and coconut trees. hahah) but the movie, for the most part, adheres to the Western method. I have to say, though, I found Jai Ho rather catchy. But where Slumdog does feel a little like a Bollywood movie is the rather melodramatic feel it has. The sense of “destiny” and the drama of Jamal’s life – losing his mother, the harsh conditions of his childhood, gangsters, rescuing a damsel in distress then losing her (no thanks to his brother) and trying to find her again… This is no “slice-of-life” story, this is full drama. The police inspector calls it “bizarrely plausible” and in a way, it is. It’s plausible, yet it does give off a slightly over-the-top impression, which makes it feel less like the European films and more like an Indian one to me. For what is essentially a British film with some Bollywood-esque overtones, I think Slumdog Millionaire does rather well. The story draws you in, and you feel for Jamal throughout the film. It’s not perfect, and perhaps not completely accurate in its portrayal of life in the slums (well, from the linguistic angle it’s already imperfect – Dev Patel speaks perfect English!) but it works. And when it comes to anything that is both artistic and commercial, if it works, then that is sufficient.